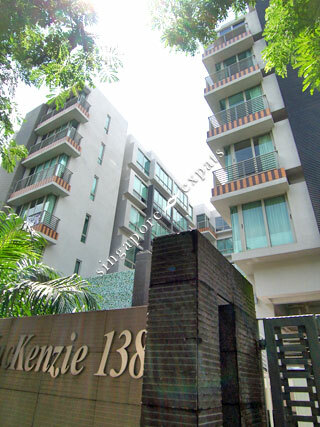 Mackenzie 138 is a low density development comprising of 35 exclusive apartments located at the private residential district of Mackenzie Road, beside Istana. Mackenzie 138's prime address provides easy access island wide via the Central Expressway (CTE) as well as East Coast Parkway (ECP). It is about 20 minutes drive away from the Airport. The Dhoby Ghaut MRT station is only a couple of minutes away. As Mackenzie 138 is just a stone throw away from the Plaza Singapura, Park Mall, Paradise Centre, amenities such as supermarkets, food centres and shop are within a short walk away. Apart from that, there are also pubs and small restaurants at Prinsep Street within walking distance. It is also near to Tekka Mall. This project is within walking distance to the Singapore Management University (SMU). I liked this condo. Since it's facing the Istana, I get no noise from Buket Tima, yet at the same time it is very close to City Center. It is perfectly comfortable, and place where you can definately sit back and relax. Very nice and quiet place. Strategic location. New development in town area. 10 mins to orchard! It's very accessible and convenient!